Directorate of Medical Education and Research (DMER) Mumbai has invited the employment notification for the 512 technical and nontechnical vacancies 2014. Looking for getting jobs in DMER Maharashtra Mumbai 2014 of 174 vacancies of clerk typist, 11 vacancies Stenographer and 32 vacancies of Lower Stenographer. Eligible aspirants can apply thorough online for the clerk, stenographer and technical posts in DMER Mumbai from 08th July to 24th July 2014. Get the full advertisement notification of DMER Recruitment like age limit, selection process, call letter for the written test exam and how to apply online for the jobs in DMER Mumbai. 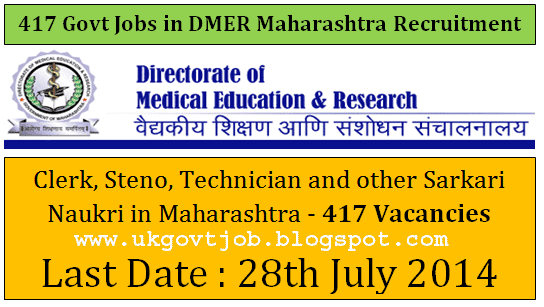 DMER Jobs/ Directorate of Medical Education and Research is going to recruiting the several staff of non-technical posts of clerk, stenographer in Maharashtra, Mumbai. Aspirants advised to apply online, read the employment Newspaper of DMER recruitment 2014. Education qualification: as per notification, qualification is different refer to the DMER recruitment of clerk-typist and stenographer. Selection process: written test and interview and typing speed for the clerk, stenographer. Application fees: General Rs. 500 and OBC Rs. 400 through the SBI challan.